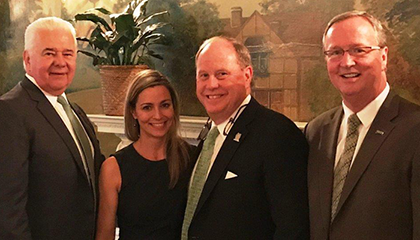 Sewickley, PA (May 22, 2017) – On May 22, 2017, Chairman Howard W. “Hoddy” Hanna, III, Pennsylvania Regional President Greg Hammill and Senior Vice President and North Regional Manager Tom Ceponis gathered with the agents of the Howard Hanna Sewickley office at the Edgeworth Club to introduce the new sales director of the office, Gloria Fuller. Fuller began her real estate career in 2004 with Howard Hanna’s Shadyside office and excelled to become a consistent recipient of the National Sales Excellence award as well as the Quality Service award and was a consistent multi-million dollar producer. She also co-chaired the office’s annual fundraiser for the Howard Hanna Children’s Free Care Fund. Prior to real estate, she attended Carlow University and was with PNC Bank for 10 years as a vice president and manager involved in business development and staff leadership. Fuller, her husband, and their two children live in the Ben Avon area, which is a neighboring area of Sewickley. The Howard Hanna Sewickley office is located at the community’s gateway intersection of Broad and Thorn Streets. In Sewickley since 1978, Howard Hanna continues to maintain the #1 market share of homes sold. The office is home to 40+ sales associates, a mortgage originator, and an insurance agent to best serve the real estate needs of its clients and customers. “Congratulation!” What a great new adventure you are traveling! Can’t wait until light up night in downtown Sewickley, to me it is a great American secret, everybody should visit; especially the Antique bookshop in town. :). Have an awesome time at an awesome office :).